Ever since I was a kid King Kong has held a special place in my heart. I think it is because the original 1933 film is one of my Mam's favourite films and I've seen it like a million times, Kong has always been my favourite movie monster. I've passed this love of the giant gorilla onto my sons Harry and Jack who love the 2005 remake and when it was announced there would be a new reboot we were all really excited. When it was finally released we decided to take my Mam and Dad with us as part of my Mam's birthday celebrations. Randa hires Conrad (Tom Hiddleston) as their tracker, not that Kong will need much tracking. Next we see a Helicopter Squadron lead by Packard (Samuel L. Jackson) who are just about to be sent home after the Vietnam War when Packard accepts the mission to take the expedition. Then there is photo journalist Mason Weaver (Brie Larson) and a group of other scientist who are also travelling to Skull Island. Obviously when they arrive at Skull Island everything goes wrong immediately. As Kong attacks the Helicopters a lot of the group are killed and the survivors are scattered across the island. 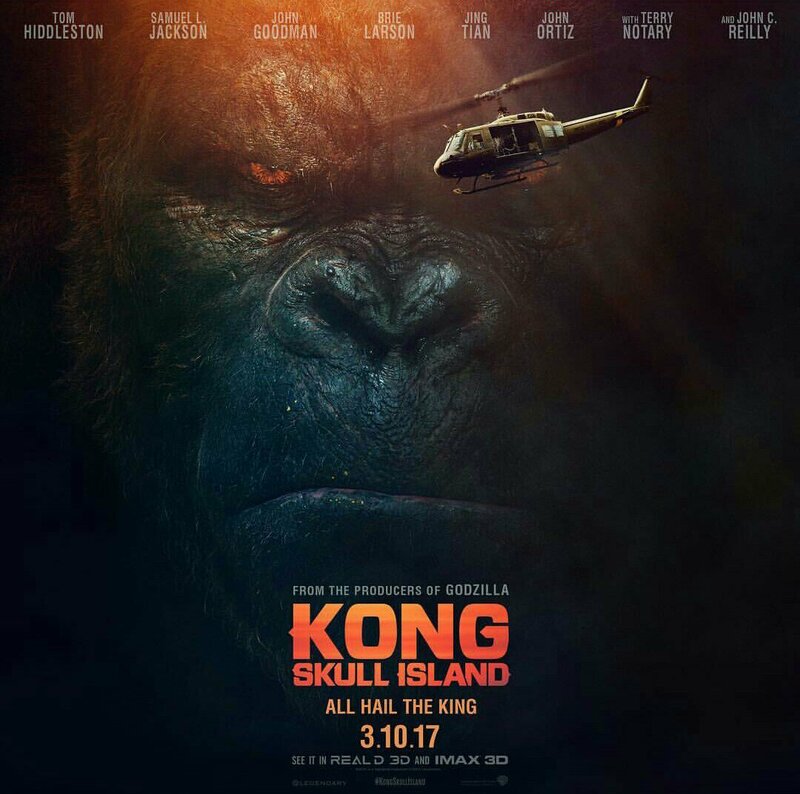 Soon after this happens we meet Hank Marlow, played by the always brilliant John C Reilly, the American pilot who has been on Skull Island for the last 29 years. Marlow is my favourite character as a man out of time and little bit unhinged. Marlow takes the group to the native Islanders village and fills them in on how things are on Skull Island. The group need to get to the other side of the island to get rescued but Packard wants to get to his remaining men, even though he isn't sure their even alive, and wants revenge for the men killed by Kong. 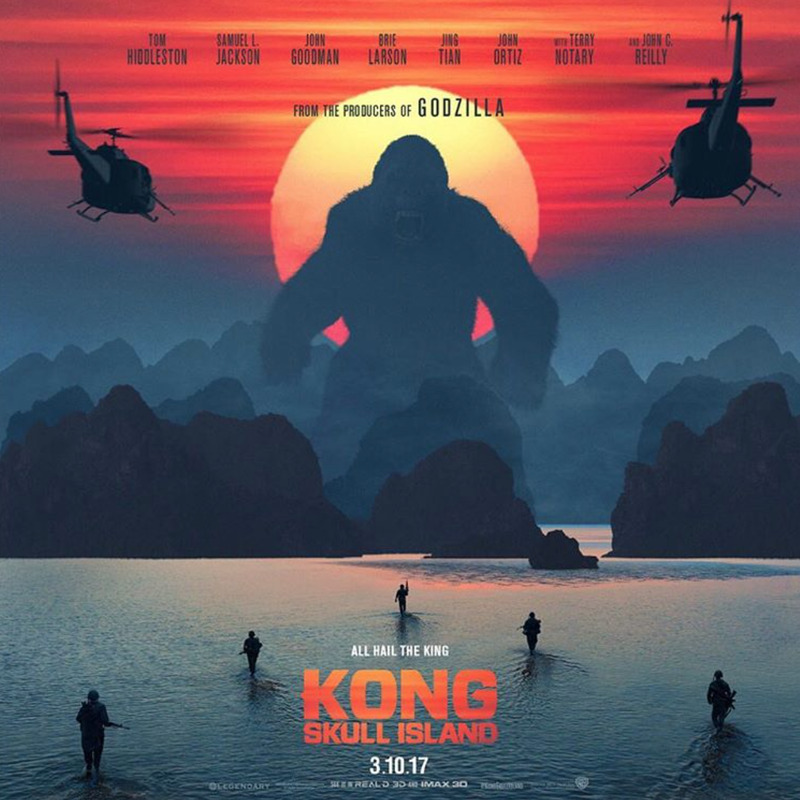 As with other Kong movies there are other monsters on Skull Island. No dinosaurs this time but giant spiders and buffalo type creatures. The main monsters Kong has to battle the Skull Crawlers, as Marlow calls them. Giant lizard like creature that live underground and come above ground for a fight with Kong every now and then. The whole film plays more like a Vietnam war movie than it does a monster movie. It is utter nonsense, but enjoyable nonsense. The cast is incredible with Tom Hiddleston as the action hero (Mrs Cool said that she can now see him as James Bond in the future) and John C Reilly as the comic relief being the highlights. The visual effects are great and all of the monsters look amazing. There has been a trend recently of incredible soundtracks on movies and with songs from Jefferson Airplane, David Bowie and Creedence Clearwater Revival this is another fantastic soundtrack. Mrs Cool has never seen any of the other King Kong movies and only came as the rest of the family were going, she thought she was not going to like it at all but actually loved this. Harry said this is now his favourite Kong film and my Mam also loved it. While this isn't as good as the iconic 1933 original it easily surpasses all of the other Kong movies. This being next entry in the movie universe first set up in Godzilla (2014) there will be sequels and crossovers for years to come. Lovers of movie monsters rejoice as there will soon be the long awaited showdown of Godzilla Vs. King Kong and I for one cannot wait.